Smoke detectors are a very important safety device.Cleaning helps ensure better operations, and testing helps to ensure that the unit is operating properly. NOTE: The tasks and timings shown here for your Smoke Detectors are based on a single-family home (owned), located in Massachusetts, United States, with priority set at ‘1 star' or higher, for all possible goals. If you set your personalization differently in your Home Wizard app, then you may get reminders for different tasks and timings in your recommended home care program for your Smoke Detectors. Clean smoke detectors using a vacuum cleaner attachment to remove dust and cobwebs. If possible, carefully vacuum inside the unit as well. 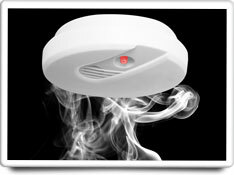 Press the test button on the smoke detector to see if the alarm goes off. Depending on the manufacture of your unit, the button may only test the warning sound, but may not check the internal smoke detection circuitry. Some units, however, have more sophisticated test systems that simulate the presence of smoke in the chamber. Check the instructions of the detector to see if it has this feature. Avoid lighting matches or candles under the detector to see is the alarm goes off, as repeated use of smoke to activate the detector can cause them to fail and not be available to operate during a real fire. The cost of this task is moderate from an investment of time standpoint. It is estimated that this task should only take about 30-60 minutes to complete, depending on the number of spoke detectors in your home. You will need a vacuum cleaner with an upholstery attachment to complete the task.